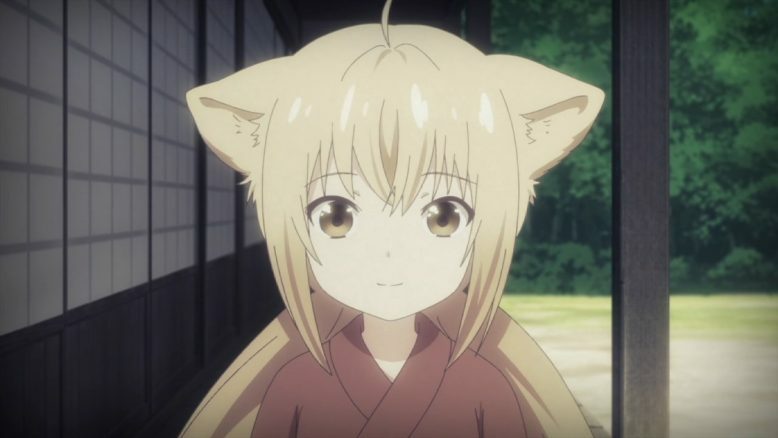 This week on Konohana Kitan the storytelling takes a slightly different approach compared to the past several episodes. Instead of two stories that are clearly split into a part A and part B, this time we get two stories that are intermixed: jumping back and forth between them at dramatically appropriate times. This approach means that, rather than getting a single large flashback for Yuzu’s backstory, we get it broken up into more digestible segments, and that viewers remain solidly grounded in the “present” time of the story. That said, I’m going to talk about each of the two stories as a single separate entity. It’s just easier for me that way. First there are the flashbacks with Yuzu’s backstory with Bikuni. I knew basically that Yuzu was a foundling and adopted child of Bikuni, but I hadn’t expected her to be “found” in quite that fashion. Buried under a pile of snow, frozen nearly solid, no sign of any adults or other family nearby… How did she get there? Where did she come from? She was wearing clothes, so she must have been from sort of civilization, at least. Yet there’s no sign that anyone ever came looking for her. It’s a mystery. Anyway, mini-Yuzu was all sorts of adorable, and Bikuni took to raising her as if she were her own child. It’s clear that the two of them became very much a family. The thought that she might be sent away sent Yuzu into a panic, and eventually a complete tearful breakdown. 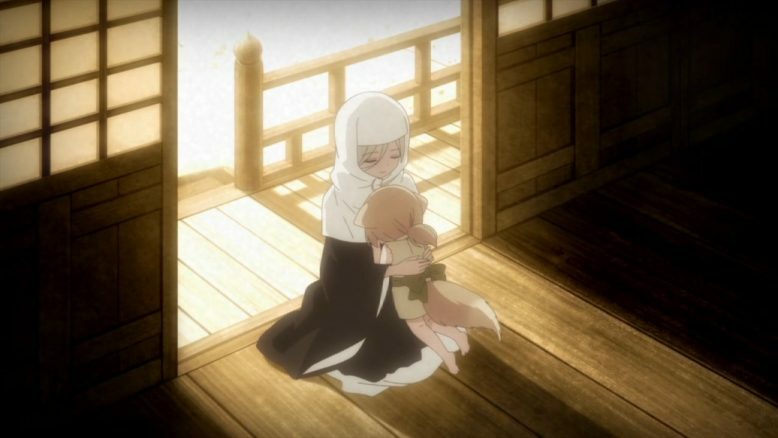 Bikuni just as clearly cared deeply for her adopted daughter’s condition, doing her best to look after both Yuzu’s physical and mental development to ensure that Yuzu would grow up well. 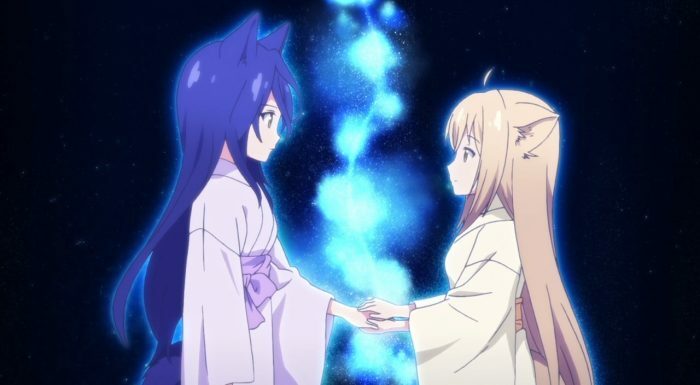 Of course, when some years later Yuzu hears about Konohanatei from a visitor, she becomes enamored with the idea of the place, and Bikuni accepts that it’s time to let her go. Just as how the best place for Yuzu to grow and bloom when she was younger was there at the temple, now the best place for her to grow is Konohanatei. Bikuni recognizes that and chooses to bring Yuzu there, despite tears of her own at having to say farewell to the daughter she has cared for over the past several years. 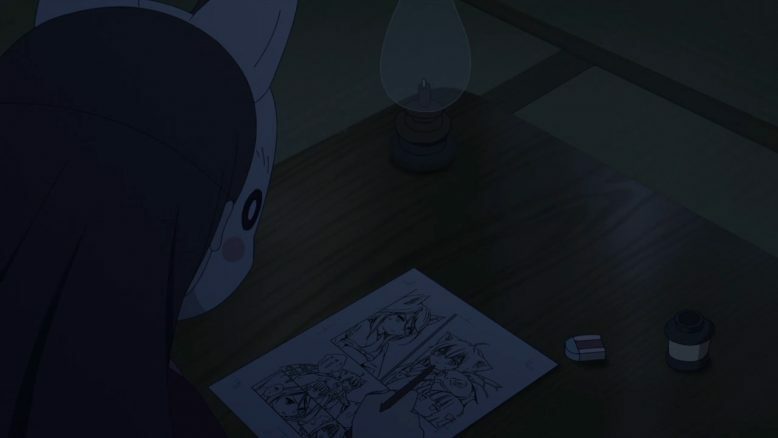 The second story in this episode is one that appeared in Konohanatei Kitan. 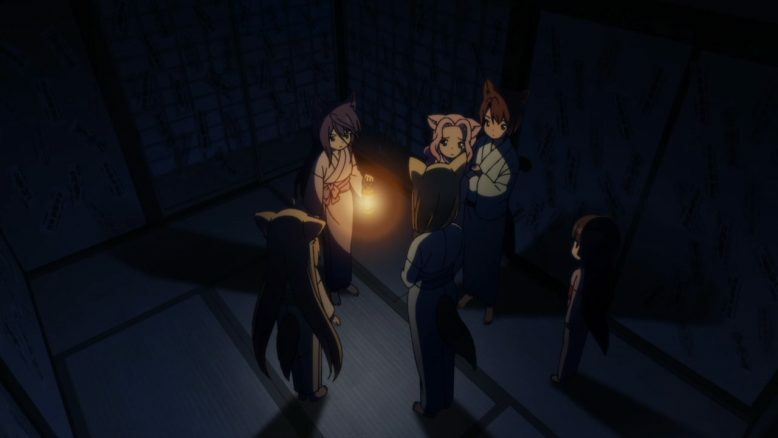 Why exactly these girls would try telling ghost stories in a town where spirits of the dead are entirely capable of wandering through, I am not really sure, but they do, and of course that results in the ghost from the story showing up. Surprisingly (or perhaps, not surprisingly, given their regular guests), the girls are quite nonchalant about there being an extra person in the room that they can’t identify: the ghost will wait, it’s more important to get the lights back on for the guests. Not a bad attitude, although, of course, the ghost isn’t quite so willing to stay out of their way. Poor Ren is probably going to take a while to recover from the ghost posing as Natsume and trying to seduce her. Likewise, Satsuki was not doing so great after being plunged into the dark. On the other hand, Sakura and Kiri weren’t bothered by it at all. I’d go so far as to say Sakura probably intimidated it. I have mixed feelings about the bit with it running off with Yuzu. On one hand I’m glad Yuzu was able to see through its disguise immediately: she has, at times, shown a surprising level of insight into people, so being able to recognize that it isn’t Satsuki makes sense with what we know of her these days. Likewise, her willingness to go along with it anyway and befriend it, and her response to it that she loves everyone and she’s grateful for the wonderful miracle that allowed her to meet all these people… these things all fit Yuzu. 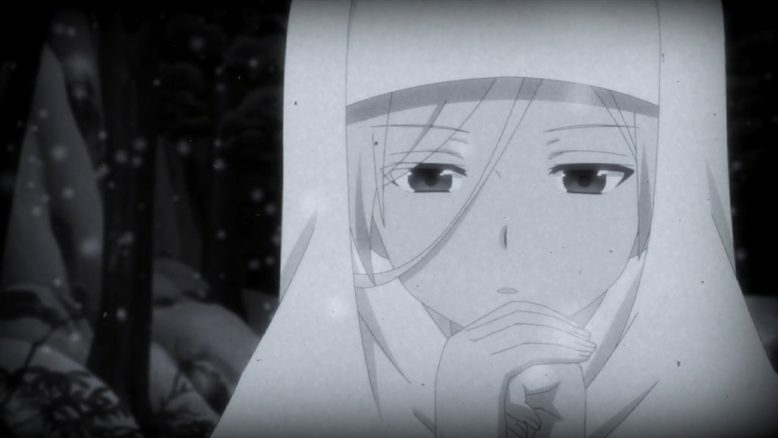 No, what bothers me is that Yuzu; despite having been raised and educated in a Buddhist temple where there’s no question she would have been taught this information; completely failed to recognize that the ghost had brought her to the Sanzu River. That sort of oversight… I can’t even imagine how it’s possible. 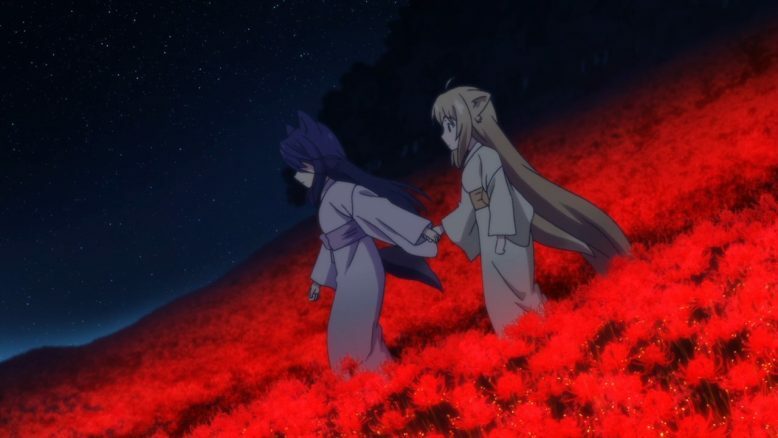 The moment I saw them passing through the field of red spider lilies I knew where they were going, and Yuzu should have known that better than me. She picks the oddest things to be airheaded about. Ah well. Anyway, that was this episode. On a whole it was decent, although I personally wouldn’t have chosen to mix the flashbacks with this particular story. It doesn’t really fit. Things like the “who do you love” question leading into the flashback, for instance, didn’t really fit with the actual content of the flashback, and so on. The thematic transitions between the present day story line and the flashbacks weren’t that good. They weren’t bad: they certainly could have done a lot worse. But it just wasn’t as strong there as it could have been. Still, I enjoyed both parts of the episode and I’m looking forward to seeing more. Did you notice that the author made a cameo in this episode?